we love LUSH at the Blushing Basics household. their products are fun, quirky, cute, cruelty free, effective and smell ridiculously amazing. LUSH also has a knack for taking a holiday and turning bath time into a holiday celebration of sorts. one of the major reasons we stockpile this stuff is because my kids 100% love to take a bath and try out their new bath bomb, heart shaped soap or delicious smelling face mask. don't get me wrong, i love this stuff too, but truth be told when you are a mother your life revolves around your kids. my time for bathing is skimmed down to the second but i let my girls luxuriously enjoy a good hour in the tub - splashing, 'cooking', playing and LUSH makes that time even better. when i pull my two year old out of the tub and she proudly shows me her pruned fingers, i know i've made their day. for Valentine's Day this year, LUSH has brought the boom and introduced some lovey-dovey goodies for your sweethearts. Prince Charming Body Wash is made with grapefruit oi and pomegranate juice for a cleansing experience that is energizing as well. a nice way to wake up in the morning, the citrus scents help you feel refreshed. The Kiss Tinted Lip Balm is vegan, preservative free and highly moisturizing. this lightly tinted balm keeps the color subtle but the shine is not. the perfect prep for your pout. Tender is the Night Massage Bar was set aside just for me and the Tman to enjoy. the long hours i have been spending at the gym would be greatly relieved by a nice back massage and this vanilla, jasmine and ylang ylang scented bar help to make it relaxing and smell amazing. Love Locket Bath Bomb was the all round favorite. 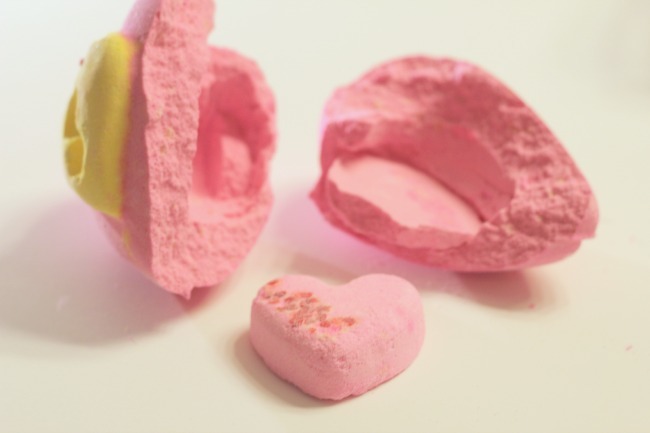 a LUSH signature product this bath bomb opens to unfold another heart inside. besides amazing scent, LUSH has also mixed in some heart shaped confetti. the girls love finding the hearts floating around and i have to admit it is kind of adorable to spot a tiny heart on their shoulder or wrist. these are just a few of the products LUSH has to offer. i would recommend heading to their site or their shop to find more.